Rojales – A pretty village located on the banks of the Segura river. Rojales has been able to keep its traditional Spanish feel, despite the onslaught of tourism and property development. With a history stretching back to the Arab Occupation, Rojales still has evidence of irrigation systems put into place by the Moors during their time in the area. Worth visiting while in Rojales are the Water Wheel, the Azud, the Charles III bridge and the Gasparito Wells, also worth a look are the cave houses at El Rodeo, where a regular craft market is held. For a cross section of villas and apartments available in Rojales CLICK ROJALES HOLIDAY HOMES All these properties can be viewd here and booked online. NEW 3 Bed Villa in Rojales - Communal Pools. Montesol is located overlooking a valley speckled with the maravellous garden products of murcia, where the mediterranean meets the orizon. A private neighbourhood where you can touch the sky between the swimming pools and spacious, relaxin garden areas. 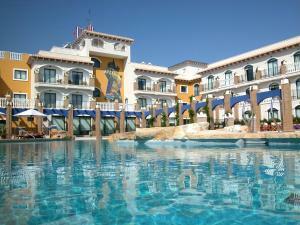 For More info e-mail: spainretreatsATyahoo.co.uk Tel: (0034) 96-679-0844 OR (0034) 679-779-122. Rojales Hills is the premier urbanization in Rojales. The Hotel La Laguna at Rojales is a wonderful retreat hotel situated on the breathtaking scenery of the natural park, Laguna de la Mata. The staff at this excellent four star Alicante hotel will strive to ensure that whatever your reason for staying you will leave having enjoyed a memorable and truly refreshing stay. Rojales is an ideal spot to spend your vacation as it is close enough to the beaches yet is not that busy as a coastal resort will be in the summer months. The nearest seaside resort to Rojales is Guardamar del Segura with its beautiful sandy beaches. The neighbouring town of Ciudad Quesada has an 18 hole golf-course and plus its own Water Park. Rojales boasts its very own excellent 18 hole golf course and clubhouse ‘La Marquesa'. There are many other golf courses in the vicinity and some are championship standard, such as 'La Finca', future venue for the Ryder Cup. As well as being a golfer's paradise, there are plenty of other activities here so the holiday villas and apartments of Quesada are rarely empty.